The teens get the signal, then flip open their packet of 30 program challenges crafted by engineers from HP and HPE. Across three rooms and dozens of tables, fingers fly across keyboards as they work together to solve problems. They compete for trophies and bragging rights. 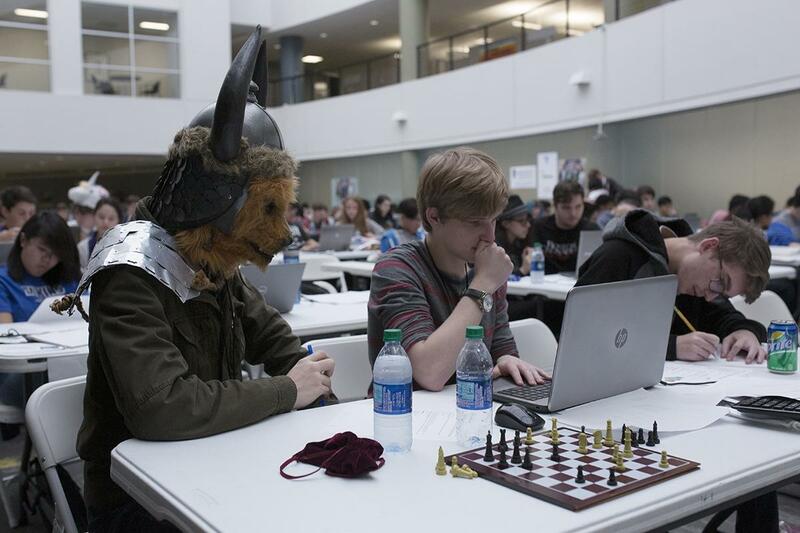 Later, they’ll also compete in the annual CodeWars costume contest. Harsany had participated in computer competitions in college and wanted to replicate that experience for high schoolers, so in 1997 he asked his manager for $500 to kick it off and invited local schools himself. Now he says CodeWars is the world’s largest high school STEM competition held by private industry, and the gathering in Houston is the largest CodeWars event of the year. Others are held in Roseville, California; Fort Collins, Colorado; Barcelona, Leon and Madrid, Spain; and at sites in Taipei and Bangalore in Asia. Many participants have gone on to have successful careers in STEM. The competition is one way in which HP and HPE are actively encouraging more young people to take an interest in STEM careers and making a positive impact in the communities in which they operate. 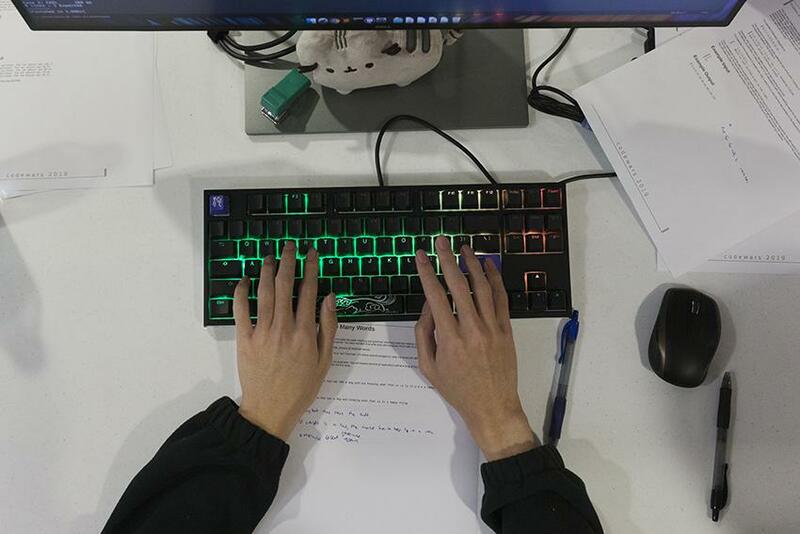 In Houston, students from 88 schools in Texas and Florida and several from Spain competed across 253 teams, more than a third of which have participated in previous CodeWars. This is the third year winners from Barcelona were invited to compete in Houston. “HP has really helped the kids push themselves, to solve bigger problems and to learn more,” says Barcelona team coach Albert Falgueras Xarbau. Students split into novice and advanced teams, sharing the same pool of problems. Challenges start out simple and get progressively harder; more difficult questions earn more points. The goal? To solve as many as possible in three hours without help from the internet. In one problem, teams have to create a program to count the number of sugar cubes students in a fictitious class used to build a series of pyramids of different heights. Judges score problems in real time so students know how they’re progressing. “I really enjoy the intensity of it, and being able to focus on programming for several hours,” says Megha Arya from Wakeland High School in Frisco, Texas. This year’s challenges featured questions about superheroes, the San Francisco skyline and Willy Wonka’s Oompa Loompas. For two points, students calculated whether they had time to make it to CodeWars if they were running late. For 22 points, they helped Oompa Loompas figure out their password into the chocolate factory. Teams could score a maximum of 209 points. Mark Matson, a software program manager at HPE, heads up the eight-member team of coders that writes the CodeWars questions. Each year, they work for months crafting challenges to stump teens. They make it fun, weaving in real-world problems and pop culture references. So far, no team has solved all of the 30 challenges. For Arlette Mcclain, a beginning coder and senior at Harlingen High School in South Texas near the Mexico border, the competition was eye opening. “It was an opportunity to see how big the world of coding actually is,” she says. She came to CodeWars with five other girls from the Rio Grande Valley, where some 40 percent of households lack Internet access and computer programming classes in high school are rare. Because of CodeWars, Mcclain knows she wants to minor in computer or data science in college. Since the event’s inception, the number of girls in the competition has grown, although not as much as organizers would like. For girls in particular, events like CodeWars are crucial. Nationwide, women remain underrepresented in the fields of engineering and science. According to the National Science Foundation, women represent half of the total U.S. college-educated workforce, yet they make up only about 28 percent of the science and engineering workforce. Organizers at HP say the number of girls participating has grown modestly over time, but still falls short of parity. At CodeWars Barcelona, the percentage of girls participating this year jumped from 18 percent to nearly 30 percent. In Houston, the percentage hovers around 17 percent. “It’s incredibly important to us to promote and engage more women in technology,” says Archana Deskus, HPE’s chief information officer and the event’s executive sponsor. 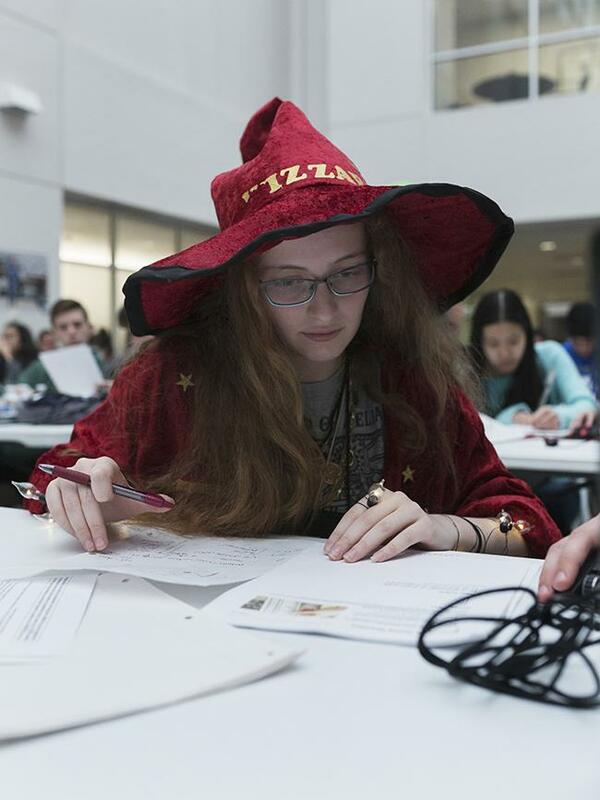 Before the Houston competition, Brianna Baskin, a junior from Houston’s St. John’s High School, dons a red velvet cape and matching hat she sewed with her mother’s help. She’s dressed as Rincewind the Wizard, a character from the fantasy Discworld novels. Baskin is interested in computer hardware, and says being inside the HPE building is a thrill. “I’m standing up every few seconds and gawking at everything,” she says. From Mayde Creek High School near Katy, Texas, junior Josie Lee grew up interested in her computer programmer father’s work. She’s attended several similar competitions, but CodeWars is her favorite. “It’s more challenging, and I like that,” she says. As teens competed, coaches — most of whom were computer science teachers — packed a conference room to give feedback on how else HP and HPE can help students. Last summer, after hearing from teachers, HP and HPE kicked off a girls technology camp, which introduces Houston-area high schoolers to careers in technology. Deskus says it’s important to create programming for younger students as well, since often, many know what they want to study by the time they get to high school. Based on feedback, HPE is now developing a low-cost robotics kit for high school and middle school students. It’s an endeavor executives hope will spark even more interest in STEM. After lunch, students and their coaches packed the main room for the CodeWars raffle. From a makeshift stage in the center of the room, HP and HPE executives handed out coveted items like wireless keyboards and monitors. Then, the 2019 CodeWars winners were announced. 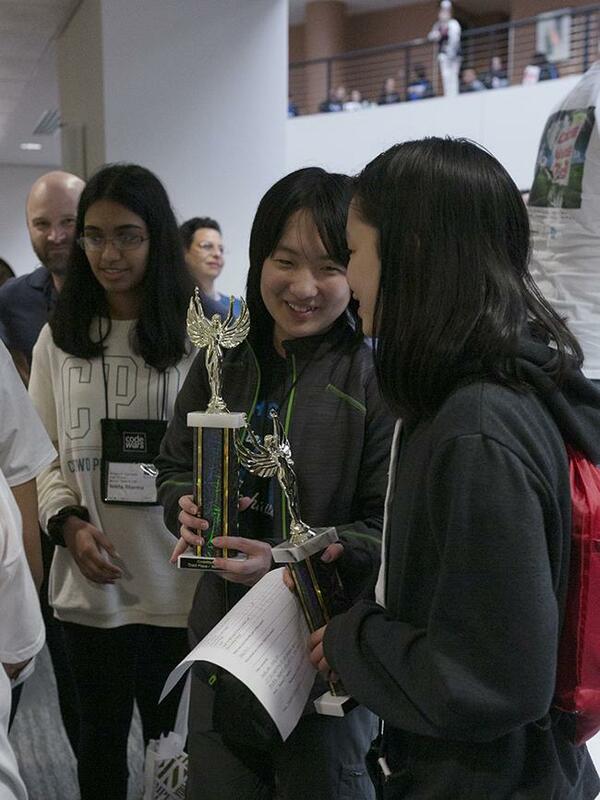 This year, the novice and advanced winning teams both hailed from Plano West Senior High School in Plano, Texas. The advanced team scored 130 points. For the first time ever, an all-girls team placed as well, winning third in the novice division. “We really want to cultivate that interest in technology at a young age,” Deskus says. Meet Mara Lecocq, a creative director on a mission to inspire girls to pursue tech careers.